Shamlu Dudeja is a multi-faceted personality. A Maths teacher and author of books, a revivalist, a revolutionary in the field of ‘good for others’. She credits her talents to her parents. A deep understanding of Mathematics came from her father, and a keen eye for design and detail in hand-embroideries from her mother. Shamlu, a name now synonymous with Kantha, a beloved traditional craft, a tangible cultural heritage of Bengal. Simultaneously, Shamlu has been an academician. 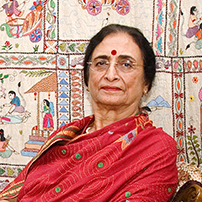 Her series of Maths text books, COUNTDOWN has been popular for 25 years in India and Pakistan. Recently, she has written a new Series for Pakistan: MATHS WISE, for children up to Class VIII. Since 1995, as the chairperson of Calcutta Foundation, she has worked towards keeping alive the motto: “Wipe a tear, spread a smile”. Shamlu set up Nivedita House, the girls’ wing of Udayan, with the invaluable help of Steve Waugh in the year 1999. With his support, she also raised funds, through friends in India and abroad, for survivors of natural calamities such as Tsunami, the Bihar floods and Aila. Several hundred SHELTER KITS for survivors in Nepal. Shamlu is also a columnist for children’s educational and entertainment pages in local dailies, since 1984.